To uncover something new is a glorious enterprise, even if it is only new to you. Now I am not an explorer or even an adventurous type when it comes right down to it. Not once do I remember having a restful night in a sleeping bag and tent, so I tend not to get too far from home. Fortunately, I live on the edge of a wilderness that is vast and breathtaking. Discovery is just around the corner, and this summer was full of it. Corey and I did not get an early start on the day I made this photograph, nor did we take a direct path to this spot. I was hoping that the summer sun would linger on the horizon long enough to cast its light on these waterfalls as we approached, but Mt. McGinnis looms large to the west and casts its shadow early. 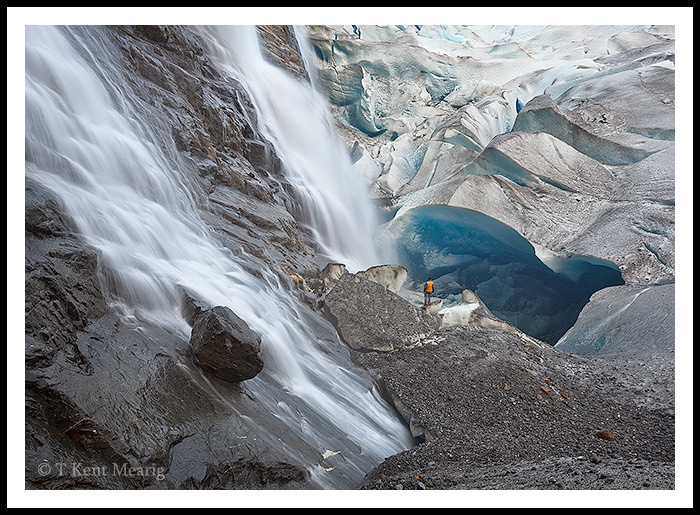 Not sure we would find a route to the base of the falls at all, we stopped to admire and photograph many of the glacier’s grand displays. Finally Corey determined a course, and we made it to a spot I had seen from a great distance on so many occasions. To witness the water pouring over these cliffs and burrowing back under the ice from mere feet away brought almost uncontainable excitement. I could have held me head under the water, but I was content enough to feel the spray on my face. Though it seems it would have been a day of satisfaction and completion, the descent to the lake was instead steeped with mystery and intrigue. A cave under the side of the glacier was growing, new and dark, over a mountain stream. In the waning light, I could only dream at what I might find deeper inside. Pretty impressive alright–even at 2×3 on my phone. Fun to imagine what it would have been like in person.